Original Tall Boot Socks is rated 4.3 out of 5 by 115. Add a personal touch to your Hunter Boots with these warm and snug boot socks. Designed to fit comfortably inside the Original Tall Rain Boot and enhance fit while adding comfort and warmth, these boot socks feature a black fleece leg and matching black fold down cuff finished with the Hunter Original logo. 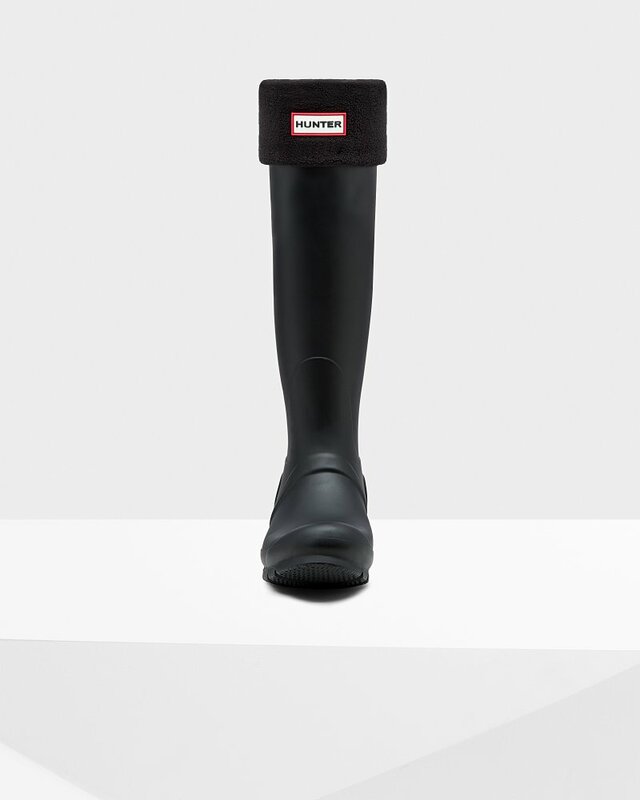 Rated 5 out of 5 by m&mm from Black Hunter Tall Socks Excellent socks for the Tall Hunter Boots. Warm and comfortable for the cooler days. Highly recommend them. I have 3 different colours, and now ordered for my daughter-in-law . Rated 5 out of 5 by EmmaB77 from Washes Well! I have a few boot socks for my tall hunters - so much easier to throw them in the wash. These ones in particular wash well because there is nothing to get caught with other items in the laundry. I have the knit tops, and the faux fur tops too. Rated 5 out of 5 by Kimberly from Excellent! I ordered a pair of the unisex tall boot socks and it came just 2 days after purchasing it.I was so happy to own a pair and it was a perfect fit.I love it and will order more pairs next time!! Rated 5 out of 5 by Goodgloves from Tall Boot Socks Very happy with my Boot Socks. They fit well, love the soft material and look great. Rated 4 out of 5 by Yasaman from Great quality It is so so so warm, it is good for wearing outdoors, not good for indoors. The color was not the same as the one was in the website. Rated 1 out of 5 by melo from Make my boots too small it seems my boots became too small after putting the socks inside :( If it's a bigger boots it might be work. Rated 5 out of 5 by Patricia from Love them! I am very pleased with my purchase! Would buy again!